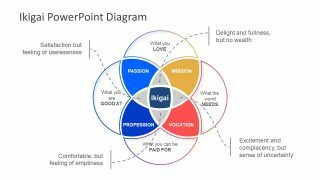 The 6 Step Modern Comparison Template for PowerPoint is a helpful tool to compare several sets of data. It is a colorful PowerPoint diagram which depicts the gear shape in broke down segments. 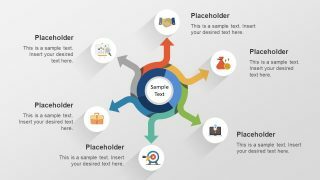 Whereas, the center of diagram displays a gear clipart to relate the theme of the template. Here, gear is the metaphor for the sense of control and efficiency. Therefore, the product comparison template comes in handy to discuss the analysis, pros and cons or value preposition. This presentation slide may also assist the academic professionals to demonstrate the evaluation of good and bad in unique gear shape. 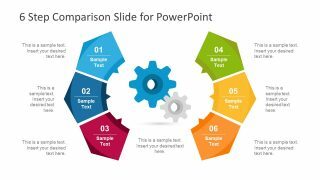 This 6 step modern PowerPoint comparison slide design is a flat vector diagram of layer object illustrating the 3D effect. Also, these PowerPoint objects are easily customizable to meet any specific needs of the presentation topic. The modern comparison template has flat design shapes with text placeholders to organize the information in segments. This way, the users can analyze two distinct entities by displaying their differences in each segment PowerPoint shapes. Further, the slides are also useful for showing bullet list points and checklists. Moreover, the fully editable PowerPoint of modern comparison enables users to alter many design options. 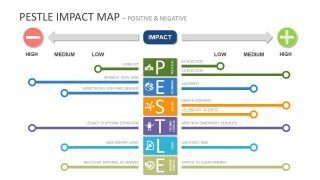 For instance, colorful theme, the size of 6 step diagram or duplicate the components to discuss more factors. 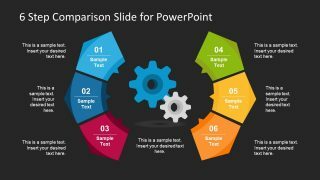 The 6 Step Modern Comparison Template for PowerPoint is a collection of various items to make a comparison. 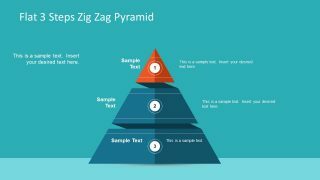 However, the PowerPoint contains two versions of 6 step modern comparison template with assorting background colors. Also, the segments of 6 step diagram has editable text placeholders to add titles and description. Whereas, the given numbers to organize the sequence of the segments. Furthermore, copy the desire background slide to use in main slide of the business presentation. Or, present this comparison by duplicating sides and highlight one segment at a time.